I made this card for last week's Featured Stamper Challenge on Splitcoaststampers. When I saw Stamp_momma's card, I knew I really wanted to use the new 'Just Buzzin By' set by Stampin Up! However, I hadn't received it yet. So I had to wait till it arrived in the mail. And when I finally got it, I quickly worked on my card. You can see Lori's original card here: http://www.splitcoaststampers.com/gallery/photo/1128572?cat=500+ppuser=4981 I changed the stamp set, colors, and eliminated the acetate and added the Cuttlebug Embossing Folder instead. My card stock colors are white, Pumpkin Pie, and black, however, if I had to do the card over again, I would use more of a yellow card stock like So Saffron. The image is colored with copics and the bees are cut out and mounted up on dimensionals. One of my favorite challenges on Splitcoaststampers is the Inspiration Challenge. Every week they show you some pictures of regular items and you are asked to create a card/project based on the piece. I just love how seeing a picture of something other than a card, inspires me to create something based on that picture! This week, they showed pictures of Lang Calenders. 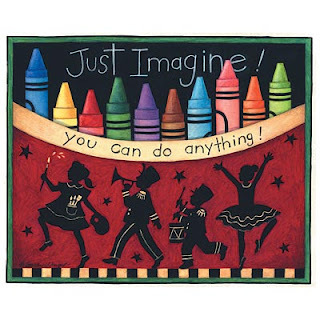 The second I saw the picture of the crayons and children, I thought of a scrap book page. I ultimately want to make a complete scrap book that would be solely focused on a child's grammar school years. So this will be one of the pages in the book. When, and if, I ever finish the book, I'll be sure to post it! LOL! To make my page, I started with an 8 1/2 by 11 piece of "Taken With Teal" card stock. I put a smaller piece of black card stock over that and hand wrote the title with a white gel pen. The crayons are stamped images from the retired Stampin Up! set 'Golden Rule Day'. I cut them out and pasted them to the page. The rest of the page is designer paper from DCWV 'The Grade School Stack'. The sub-title is hand written on a piece of 'Naturals Ivory' card stock and sponged with 'More Mustard'. I cut a black piece of Card Stock to fit a 4 x 6 photo, and I placed another piece of "Naturals Ivory" Card Stock behind it. Well, now that I'm a 'working woman' I won't be able to post everyday like I have been. I really enjoyed my first full day of work yesterday, but, it was quite the work-out! We spent the whole day unloading big heavy boxes and reloading them or moving them to another location as we began setting up the new store. My legs and arms were really feeling it by the end of the day! But the good news is that I lost 2lbs in one day! That's a rarity for me! LOL! So for today's post I'm going to show you a couple of cards I made about a week ago. The first card I made for a design contest I entered where they wanted you to make a card using mostly die cuts. I used the Cuttlebug Cut and Emboss Flower Die for the large flower. I sponged the edges with 'More Mustard' ink and the flower center with 'Close to Cocoa' ink. The tag is also a Cuttlebug die, and I hand-cut the stem. The Bee is a Sizzix Die. The background is stamped in 'Brocade Blue' with the retired Stampin Up! Background Stamp 'Stitched'. The Card stock Colors are Brocade Blue, White, So Saffron, black, and Wild Wasabi. The second card I made was for a sketch challenge on Splitcoaststampers. This was probably one of the more difficult sketches they have had in a while. Because I didn't see much room for an actual image, I used a die cut by Cuttlebug in place of a stamped image, and lots of patterned paper from "The Pet Stack' by DCVW. The sentiment is from the retired Stampin Up! set 'So Very'. I sponged the kitty with 'Chocolate Chip' ink. Other card stock colors used are: Wild Wasabi, Close to Cocoa, Chocolate Chip, Brocade Blue, and Naturals Ivory. Have a wonderful day! I'm back at work tomorrow, hopefully we can start unpacking the 'goodies' and loading them on the shelves! Yippee! Well since we have yet another 'arctic freeze' here in Northern Wisconsin, I decided to post some Winter Garden Pictures for all of you. As many of you already know, I am an avid flower gardener. I have a two acre property that is filled to the brim with flower beds. If you'd like to see pictures of what the garden looks like in the summer, you'll have to scroll back in my blog quite a bit, or, wait till spring....LOL! I'll be posting pictures of my garden all year long. My philosophy on landscape gardening is that there should be visual interest all year long, and not just during the growing season. Because of that, I don't cut alot of my foilage down to the ground in the fall. And also because the birds love to eat the seeds from the dried flower heads and its also less work for me to cut it down in the spring when more than half of the foilage whithered away on its own. LOL! The first picture is of a creepy, old barn on the other side of my property fence. I just love the way it looks....I love the look of weathered wood, and I'm thrilled I can see it from my yard. But I wouldn't step foot inside this barn in a million years! LOL! I can only imagine whats inside of it! LOL! The next picture shows the river and woods that my garden overlooks. What beauty! Here is a beautiful pine tree whose boughs are heavy with snow. I have a white picket fence surrounding my whole yard. You don't even want to know how long it took me to paint it! My husband attached some bird houses on the fence for me. Here they are covered with snow and overlooking the woods and river again. Here is a peek of my garden shed seen through a white pine tree. This is the front of my shed, which is buried in snow! I can't even get inside of it this time of the year! Here is a view of a smaller pine. In the distant you can see the rest of my yard. The white house is a neighbor's house. Just a couple close-ups of some dried up foilage in my winter garden. To the left is blue globe thistle and on the bottom is a aster. I hope you enjoyed seeing pictures of my yard and garden in winter. My header is also a picture of my garden! When spring comes, I'll be sure to post pictures of all my flowers as they bloom. Here is a card I made using the this week's color challenge on Splitcoaststampers and the Paper Craft Planet's sketch challenge. I made this card for an elderly friend of mine who's husband had a heart attack and is on a respirator. Now, to make matters worse, SHE is in the hospital too! She is too old to handle the stress I guess. The image is MFT 'Rain or Shine'. The Card stock colors are Bravo Burgundy, Regal Rose, and Kiwi Kiss. I used my Stampin Up! markers to color the image. I used Stampin Up! 's Scalloped Border Punch and the Scallop Circle Punch . Ribbon and adhesive crystals were added for embellishment. I made a few more Valentine Projects to show you. I dropped all my Valentine goodies off at the Consignment Shop yesterday, and they seemed so happy with everything I have created...now I need to start making things to sell for Easter! Any ideas? My first project is a Valentine Card I made using the this week's sketch challenge on Splitcoaststampers.com. I used my Cuttlebug to emboss all the panels. The image is from 'Cuddles and Hugs' by Melanie Muenchinger, sold at Gina K. Designs. I colored the image with Copics and mounted it up with dimensionals. I cut the hearts out with my Cuttlebug, sponged the edges, and stamped sentiments from MFT's 'Hearts Galore' set. Card stock colors are white, Pretty in Pink, and Real Red. My next project are Valentine Gift Bags. I thought, if people bought one of my handmade gifts at the store, they'd need a pretty bag to put it in. I took plain, small, white Kraft bags and put a piece of white card stock on the front that was covered with Riding Hood Red Designer Paper from Stampin Up!. I used the Martha Stewart Lace Border Punch, ribbon, and Cuttlebug heart dies for embellishment. The images are all either retired Stampin Up!, MFT "Hearts Galore', or something I picked up at a Local Scrap Booking Store whose name I no longer remember. LOL! Finally, I made some little treat bags to just sit in a basket on the counter. The images are $1.00 stamps from Michaels. I used my Nestabilities to cut large scalloped squares, folded them in half and stapled them to a small treat bag. I wrapped a ribbon around to hide the staple, added my stamped image and some Cuttlebug hearts. I had a wonderful time at my first day of work. I think I will really enjoy working there and also working with the other wonderful people there. I felt such peace and happiness at the Orientation meeting. Its hard getting back out into the 'Paid' work force after a twenty year absence, but I really felt I was completely in God's will and plan for my life yesterday. Finding a job in the midst of this terrible economy and job market was tough, and at times I questioned my own self-worth, but now I see God was 'holding this special job' just for me, because He knew it would be perfect for me. Praise the Lord! I made a birthday card using the retired Stampin Up! set 'Thing of Beauty'. My cardstock colors are white, So Saffron, and Regal Rose. The designer paper is Basic Grey. The sentiment is from Inkadinkdo. The embellishments are primas, brads, Martha Stewart Wedding Brads, and the Martha Stewart Scalloped Lace Border Punch. I sponged the edges of the card with Antique Linen Distress Ink to 'age it' a bit. the image was colored with Copic Markers. I start a part-time job at a Fabrics and Crafts today. I'm nervous, but so excited. I haven't worked in the 'Paid' workforce for over twenty years, so this is definitely a new experience for me. I'm excited to be working for a great company and being around all that crafty product all the time! I just hope most of my paycheck doesn't go to purchasing new 'toys'. LOL! Have a great day! I bought several wooden boxes at a local craft store, for about $1.00 each and altered them. The first box I altered is an index box. I made a card organizer box out of it. I covered the outside of the box with a glittery designer paper from DCWV called 'The Glitter Stack'. I cut three labels using my Nestabilities from Spellbinders. The biggest label is a really sparkly silver glitter paper. The white and black labels are mounted up on dimensionals. The title was made using Hero Arts Alphabet Stamps. Inside the box are four dividers that say 'Thank You', 'Happy Birthday', 'Sympathy', and 'Get Well'. I used a tag punch to create the tags and the words are computer generated. I made four matching cards and envelopes to match the box. My second box is an octagonal shape. I covered the box with Purely Pomegrante cardstock that was embossed with Cuttlebug's 'Textile' Embossing Folder and then rubbed with gold ink. I painted the edges and inside with gold paint. I added a ribbon and hat pin for embellishment. The butterfly is a 'Cut and Emboss' die from Cuttlebug. I cut and embossed the butterfly twice: once in pink cardstock and once in vellum. I attached adhesive pearls to the center. My local consignment store called me and asked me to bring in some Sympathy Cards, so off I was on another card-making mission! I made a variety of Sympathy Cards to fit the personality of the giver. The first card uses the retired Stampin Up! hostess set 'Oh so lovely' and the jar image from 'All Wrapped Up'. I cut two holes with an Exacto Knife on the sides of the jar to wrap a ribbon through. The paper is Basic Grey, Pretty in Pink, and Wild Wasabi. The sentiment is from retired Stampin Up! 'So Very'. The second card uses an image from Inkadinkado. The paper is Basic Grey and Close to Cocoa. I cut some tiny flowers with my Cuttlebug Spring Die and attached them to the branch the bird is sitting on. I put an adhesive crystal in the center. The sentiment is from retired Stampin Up! 'Brighter Tomorrow'. The third card uses the "Cut and Emboss" butterfly from Cuttlebug. The paper is a white, iridescent opal I picked up from my local scrap booking store, Apricot Appeal, and Pale Plum. The white edge is the retired Stamping Up! background stamp 'Fine Lace' embossed with white embossing powder. The fourth card also uses a flower from the 'Oh, so lovely' set and Basic Grey paper. The lilacs in this card are from the retired Stampin Up! set 'Blossoms Abound'. The red flower is a little flower from a Rubber Stamp Tapestry set. This card is an example of Two-Step Stamping. This card uses the retired Stampin Up! set 'Symbols of Salvation'. The ivy is a little stamp from a Rubber Stamp Tapestry set. I put a piece of vellum over the cross to soften it. Cardstock colors are Sage Shadow, Chocolate Chip, Old Olive, and Very Vanilla: the color challenge colors on Paper Craft Planet last week. I mounted up the sentiment on dimensionals, and embossed the Sage Shadow panel with the Cuttlebug 'Floral Screen' embossing folder. My final card uses the retired Stampin Up! set 'Heartspeak' for the main image and the retired background stamp 'Floral Screen'. The main image panel is mounted up on dimensionals. The cardstock colors are So Saffron, Tangerine Tango, and Wild Wasabi. I stamped the Floral Screen image in Old Olive ink. The tag is Cuttlebug and I hand-wrote the sentiment. I hope no one needs to buy my sympathy cards at the store for a long, long, time and they just sit and gather dust. That would be perfectly fine for me! But if the need does arise for someone to make a purchase, I hope these cards give comfort to the recipient. On Patter Cross's blog 'Triple the Scraps' she started a new challenge called the 'His Holy Name' Challenge. Every two weeks, Patter will give her readers a word based on an attribute of God's. We are to make a 6 x 6 scrapbook page using the word in a Scripture Verse. At the end of the year, we'll have a wonderful spiritual book to display on our coffee table, or give away as a gift. The very first challenge word is 'Holy'. I chose the verse from Isaiah 6:3 'Holy, Holy, Holy is the Lord Almighty; the whole earth is full of His glory' because its one of my favorite verses. I LOVE singing this hymn in church too! To make my page, I started with a 6 x 6 sheet of Basic Grey Designer Paper. I then stamped my angel images from the retired Stampin Up! set 'Angelic' on white cardstock, colored them with Copic markers, cut them out and adhered them to the page. The sentiment is computer generated. I added a side panel of more designer papers and brads for embellishment. This is my last post till Monday. I'm off to see my daughter 'STAR' in the leading role of her college opera! I'm sure I'll have lots to tell and pictures to show when I get back. Oh my goodness, would you believe its only 50 degrees inside my house right now! I have two coats on, and my hands feel like ice! We don't have a furnace, we only have in-floor heating in the basement that rises to the rest of the house, and a wood-stove. Normally, that's enough, but in bitterly cold temperatures like these, the wood stove can't keep up. My son has had two days off of school because of the dangerous temperatures and wind-chills. I believe we broke a record of 27 degrees below zero yesterday. UGH! Spring, hurry up! My daughter asked me to make a belated Christmas gift for one of her roommates who is studying music composition at college. So I bought a manuscript paper pad and covered it with black cardstock and music designer paper. The panels were made with my new Nesties. The stamps were purchased at Hobby Lobby and for some reason didn't have the name of the manufacturer stamped on the side, so unfortunately I cannot provide for you. I stamped the three music notes on the bottom and cut them out and adhered them to the cover. Ribbon was added for embellishment. Well this will be a LONG post because I have lots of Valentine Projects to show you today. Its been about 20 below zero in Wisconsin all week, so I have been 'hiding out' in my toasty, warm craft room making lots and lots of Valentine Goodies. For my first project, I made a 'Love Coupon' book using a stamp set I won as blog candy on Melanie's Blog 'Hands, Head, and Heart'. The name of the stamp set is 'Cuddles and Hugs' and is sold at Gina K. Designs. To make this book, I cut two hearts out of chipboard and covered them with 'Berry Bliss' designer paper from Stampin Up!. The inside pages are 'Pretty in Pink' cardstock with more 'Berry Bliss' paper on the bottom for the 'pocket'. The paper is double sided, so I just fold over one half an inch and add a little piece of white cardstock, punched with the Martha Stewart Lace Trim Border Punch for embellishment. I stamped all the Pretty in Pink Cardstock with the heart image from MFT's 'Hearts Galore' with Pretty in Pink ink. It adds a nice subtle background. The title on the front cover is made with Cuttlebug Dies. All the images are colored with Copic markers. Every page contains a 'Pocket' where I slipped in little 'love coupons' which can be redeemed by the recipient of the book. They say things like 'One free kiss', 'One dinner out', etc. My next project is a hand-stamped stationary set that I altered. I received some stationary for Xmas. When I was done with it, I kept the box and altered it to look like this. I covered the bottom of the box with red cardstock. Then I stamped 10 sheets of nice resume copy paper and 10 envelopes, using the Crafty Secrets 'Cherish' stamp set. For the outside, I wrapped a piece of 'Riding Hood Red' designer paper from Stampin Up! around the box. Then I added ribbon, primas and brads for embellishment. I also made a matching tag that says 'Love Forever' on it. It looks so much better than what the original store-bought box looked like! LOL! Here is what the stationary paper and envelopes look like. For my last project, I used the 'Origami Box' from this week's Technique Challenge on Splitcoaststampers. I used 'Close to Cocoa' and 'Riding Hood Red' designer paper from Stampin Up! for the box. I used chipboard for the top and bottom to make the box more sturdy, covered it with designer paper, and attached it to the box with glue. The scalloped square is a Nestability, the hearts are Cuttlebug, and the sentiment is a one dollar stamp from Michaels. I filled the box with Dove dark chocolates. Here is a side view of the box. Believe it or not, the center box is made WITHOUT using glue! You just fold, fold, and fold a 12 x 12 piece of paper. Check Mondays Technique Lover Thread on SCS for instructions, or email me for the link. Here is a view of the inside of the box. I hope I've inspired some of you to make a home-made gift of love for your loved one.